Harold Oakhill sent a freight car update recently. He models the Ulster & Delaware Railroad in 1924, just before it was absorbed into the New York Central. Here are Harold’s latest freight car additions. I just finished the final weathering of four New York Central and Michigan Central 40-foot automobile box cars (XA) of 1916 vintage. In addition to reflecting vintage prototypes, these are vintage resin freight car kits originally produced by Dennis Storzek in the 1980s. Dennis sold the masters and the kits were marketed under the name Des Plaines Valley Car & Foundry for a while. I picked up one of these kits around 1990. In 2013 I purchased another kit, plus a box of sides and ends for nine more cars and assorted parts from Cyril Durrenberger. Most of these sides and ends had bubble holes, but there were enough good castings and other parts to cobble together two more cars. I did have to scratch build a roof, two floors, and a few underframe struts. I originally bought the extra parts for the cast Murphy ends so I could build some steel frame shorties from MDC boxcar shells. Most of those ends are good. This early resin kit was an interesting mix of mediums; resin, wood, wire, cast metal, styrene, and ABS plastic. Cyanoacrylate cement (CA) holds most of the parts together. I used canopy cement to install the wood roof walks. The lettering was cobbled together NYC 36-foot box car decals created by Dave Campbell and sold through Resin Car Works. And yes, I changed some of those tiny little numbers to show the correct dimensional data for a 40-foot car! Several prototype photos were used for guidance. The decals were printed by Rail Graphics and are an absolute joy to work with. I painted the cars with PollyScale Boxcar Red and weathered them with an airbrush and PanPastels. Each car has a slightly different level of weathering. 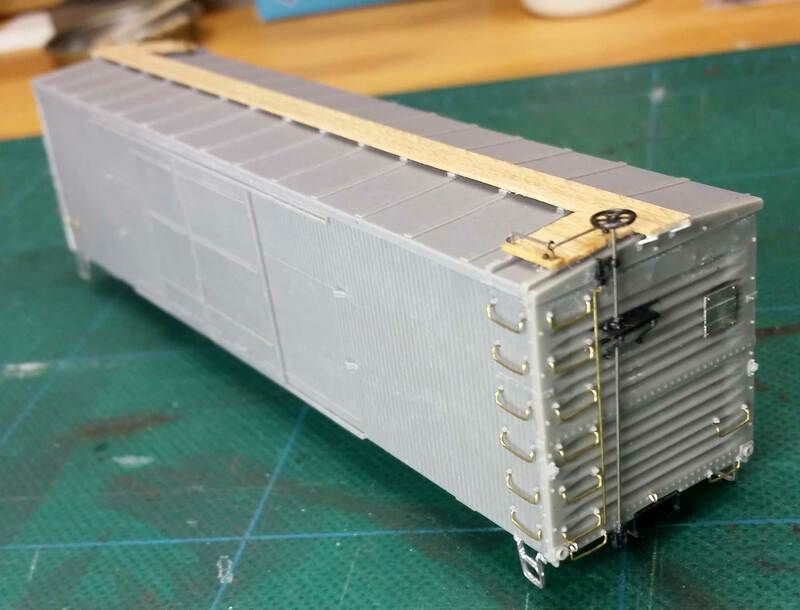 Thank you, Harold, for sharing your work on these vintage resin freight car kits. Terrific looking models. I think that this series of cars is currently available from Westerfield. Dennis’ patterns and castings are still, after all these years have gone by, some of the best work ever done. Nice work and nice musings on the hobby. Thank you. Keep up the good work. I too like the black & white photo. I had to look twice to make sure they were models. I have often thought of modeling the U&D, but so far only have read about them. Have you ever published in any magazines? Nicely done! I especially like the low angle, black and white photo, very prototypical. Thanks for sharing some very nice models.